For additional information on brake fluid specification, refer to “Recommended fluids/lubricants and capacities” in the “Technical and consumer information” section of this manual. CAUTION Do not spill the fluid on any painted surfaces. Check the brake fluid level in the reservoir. If the fluid level is below the MIN line B , or the brake warning light comes on, add Genuine NISSAN Brake Fluid or equivalent DOT 3 fluid up to the MAX line A . If fluid must be added frequently, the system should be checked by a NISSAN dealer. Check the fluid level in the reservoir. 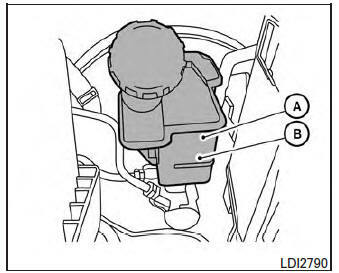 The brake fluid reservoir is shared with the clutch hydraulic system for manual transmissions. 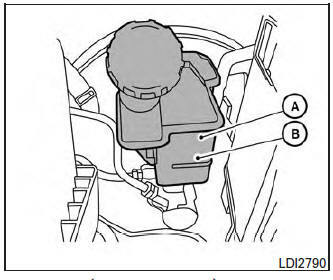 If the level is below the MIN line B , or the brake warning light comes on, add Genuine NISSAN Brake Fluid or equivalent DOT 3 fluid up to the MAX line A . If fluid must be added frequently, the system should be checked by a NISSAN dealer.